Featuring four very different characters cooped up together in a New York City apartment, Carnage – Roman Polanski’s take on Yasmina Reza’s Olivier award-winning stage play – is every bit as claustrophobic, caustic and darkly amusing as you’d expect. It also marks somewhat of a departure for Polanski, being very much the antithesis of his previous effort, The Ghost. 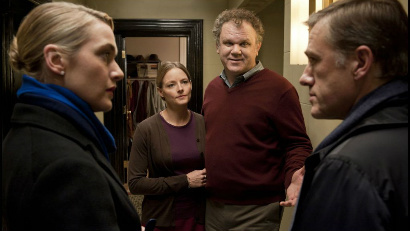 Forced together by their respective children’s playground scrap, two sets of parents, Michael and Penelope (John C. Reilly and Jodie Foster) and Alan and Nancy (Christoph Waltz and Kate Winslet) try to resolve the issue calmly. As time wears on and emotions become fraught – not least by the differing opinions of both couples and the copious amounts of alcohol being drunk – their supposedly peaceful meeting spirals into chaos. It may not sound overly cinematic from the slight conceit, but Polanski and co-writer Reza use the deliberately limited dimensions of their set to their full extent, getting right into the human psyche and showing how one may not truly be how they outwardly appear. What begins as harmless chit-chat between parents wanting to act on their children’s behalf slowly descends into taut anger, hysterical emotions and projectile vomiting – each couple nay, person, comes out changed for better or worse as the night draws to a close. Apart from the odd running gag, the humour isn’t imparted lightly. It’s teased out little-by-little, bit-by-bit, through the enclosed atmosphere and building animosity experienced – and aired – differently by each character. It’s a setup that’s off-killter, but due to Polanski’s ingenious movements of the camera (using every available position to ensure there’s no safe place) it works to tremendous effect. Alexandre Desplat’s stripped-back score compliments the mood seamlessly, stepping up its pace only as tempers mount. It’s very much a character piece, and the intimate setting edges out terrific performances from all four of the central players, not least in the interactions they have with one another. Winslet and Reilly are the stand-outs, with Nancy and Michael switching over roles midway through: her slumping into mild, alcohol-induced resolution and him becoming fired up and erupting when it all becomes too much. There are moments when it slips too far back into stagey mannerisms, but Polanski does a commendable job at turning something which you’d expect to feel staged into a cluttered collection of contradicting emotions and opinions. The performances feel true-to-life, as does the way in which a trivial act can erupt into such extreme reactions, forcing one’s true self to escape the perfectly masked exterior. hi-yah, u have a great website! If you post Cam sexs more I’ll visit your website again!